Medical congresses are one of the most important and intensive marketing activities a company can undertake. Here, Account Director Dolan Desai and Senior Creative Copywriter Dale Choate give you the practical tools and tips you need to create a leading congress experience. Whatever therapy area you work in, medical congresses are one of the most costly, time-consuming andimportant marketing activities that your company will undertake during the year. Congresses are one of the only truly experiential marketing opportunities that pharma brand teams get with healthcare professionals.You have the opportunity to integrate activities to provide customers with a three-dimensional brand experience, where you can share the physical, emotional and scientific aspects of your brand. In turn, customers can engage with brands free from the time constraints of their daily routines. It is one of the only times they are actively open to spending quality time with your commercial and medical teams. The time they are willing to spend with your brand increases with the value of the experience they receive. If you successfully focus on their needs – the customer experience – and exceed their expectations, you can significantly increase your brand equity. Get it wrong, and you could miss this golden opportunity. Do you know what a good congress experience looks like? What is a good congress result, and more importantly, how do we make sure the congress is a success? What activity will most engage your customer? How do you maximise the return on your investment? Blue Latitude Health Account Director Dolan Desai and Senior Creative Copywriter Dale Choate set out some of the key steps to ensure you prepare, deliver, and improve your congress activity. The majority of the work needs to begin well in advance of the congress. Thoughtful and considered planning is probably the single most important step to ensuring your congress is a success. Activate: have a clear call to action. Your congress goals should be driven by your brand strategy and critical success factors. They may be centred on awareness, education, behaviour change, or perhaps something future-facing. Whatever your congress objectives are, we find it useful to contextualise them through the above framework. This will help you validate your approach to the congress, and may even assist you in making decisions when it comes to prioritising time, budget and resources. It’s not about you. 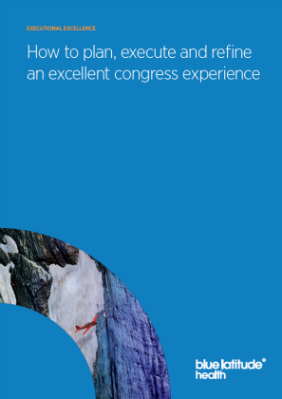 Keep the customer at the heart of everything you do – congresses are a customer experience before a brand experience. Delegates attend congresses to learn more about treatments and advances in their therapy area, but also to network and fulfil personal goals. They get to take a break from their daily routine, socialise, and even have fun. Think about how you can design experiences that meet their unmet needs. Map out the customer journey for before, during, and after the congress, to develop tactics and messages that are engaging and relevant. Develop messaging and collateral for those customers that can’t attend the event. Avoid the temptation to repurpose materials for an existing audience, based solely on them having been already developed and approved. Tactics and messaging will only benefit your brand when they are engaging and relevant to the delegates attending the congress. Introducing a new tool for developing a stakeholder-centric brand, based on the experience your patients and their HCPs want and need. Dina Patel speaks to Omri Shor, Co-Founder and CEO of Medisafe, to find out how his medication management app is tackling the problem of poor adherence. Inside this downloadable pack, you’ll find a wealth of exclusive information on the way multiple sclerosis is commonly treated today. As well as areas of continuous improvement for the industry. MS advocate Trishna Bharadia explains the numerous factors that lead patients to choose a disease-modifying therapy, including the important considerations healthcare professionals and pharma often forget. Blue Latitude Health Senior Associate Consultant Will Frostick delves into the MS treatment landscape and explores some of the cutting-edge treatments on the horizon.